Dark russet brown with a finger of off white foam on the surface that recedes to a thin surface skim and a tiny bit of spotty lacing. Aroma is mildly fruity and malty, with mild trappist yeast esters. Tastes like multigrain bread with a little bit of spiced apple, mildly vinous. Light bodied for 8%, somewhat creamy texture. Dry finish, mild clove. Overall this is pretty good, though the Trappist Extra is the best Achel beer. 11.2oz bottle poured into a chalice. A: Burnished red-orange color with perfect clarity and brightness. Cream-colored head settles after some time, and leaves spotty lacing on the glass. S: Fruit cake, molasses, brown sugar, raspberry and a hint of grape. Brown bread. Mild phenols with some pepper/clove and a whisper of vague spices. Soft whiff of herbal hop. T: In taste, we have a lot more complexity than was apparent on the nose. Fruit cake and brown bread. Hints of toast and cocoa. Nutty. Raspberry and currant. Herbal hops, soft brush of bitter alcohol, pepper, clove, and medicinal phenols. Goes bone dry by the mid palate and into the finish, which is abrupt with a lingering sense of baking spice and herbs. M: Medium-full body. Chewy and creamy with a slight sense of heft that is briskly lifted away by the sharply scrubbing carbonation. O: The nose is shy, but the palate is contemplative. Bigger than your average dubbel, and really more in Belgian Strong Dark territory, but this is nitpicking. This is a Trappist classic, and worthy of that appellation and the reputation it carries. Slightly musty. Dried figs. Halfway dry. A touch of marzipan. Not a lot of personality. Lively carbonation but flacid flavour. A beer that wasn't the strongest on the nose given the strength & style but it wasn't quite weak either & a things became more pronounced with the taste as well with plenty of dark fruits & sugars coming through with this one. The beer had some nice prune & raisins in the early going with bread & caramel malts alongside some subtle toffee sweetness & spices. It's was a well carbonated but dry beer with a nice balance, although some of the alcohol content was showing & it was a slightly boozy offering at times too but still a very drinkable beer as well. Pours a lovely deep burnt umber, voluminous caramel head which lingers a while.....lacing reasonably good. Aroma is spiced, think malty cinnamon and your on the money. Taste is really very good, a warming malt and plumb, not too boozy despite the abv. Feel is a touch artificial with a sweet residue, but goes down smoothly enough. 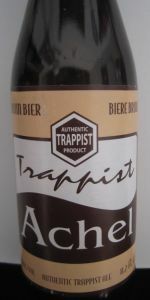 One of my last Trappists. I think I've had most of the other ones. Stumbled upon this one by chance in a store in Shanghai China. A: Poured from the 330mL bottle into a goblet-style glass. The beer is a dark brownish red, pure red when held to light. Head was off-white, foamy, and 2 fingers with ok retention. S: Dark fruits and booze in there, medicinal note with brown sugar to balance and smooth things out. Fruity yeasty notes all throughout. T: Mostly dark fruits, especially cherries and plums. Some brown sugar in there and some balancing malt. Has a light yeast note in there that adds a hint of tartness, almost with the effect of making a cherry pie kind of flavor. Then the alcohol comes in. F: Smooth with a bit of light carbonation. Overall: I liked this beer. It had a really nice unique flavor, although the alcohol wasn't as well disguised or blended as I would have liked. A very solid choice. A - Cloudy dark brown, a finger of head that dissipated after a minute. S - Strong dark fruits, not much of a booze vibe. T - Nutty/belgian yeastiness up front. Perfectly balanced with the dark fruit and alcohol. M - Excellent mouth feel with the level of sweetness and carbonation. O - An excellent, true Belgian Ale. I may have a let it age for too long (3+ years) but I'll remember not to do that next time. Overall, a very nice standby for me.